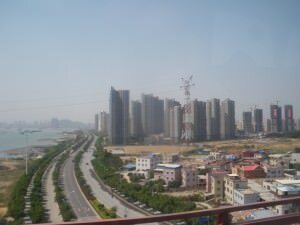 Xiamen – my first X city! Sitting relaxing by the harbour! Xiamen intrigued me immediately for one peculiar reason – it’s beginning letter. I was sure that until 2012 I had never been to a city beginning with the letter ‘x’. The nearest I had come was when I was in Taiwan and got a train at Xincheng Station near Hualien, and stayed in the city of Shinying (sometimes called Xinying). So after an epic trip through the Fujian Tulou buildings in the centre of the Fujian Province near Yongding, I hopped on a bus from Shuyang Town to Xiamen. The ‘X’ City by the harbour in Fujian Province, China! By the way, China has a few other cities beginning with ‘X’, namely Xian and Xinyuan. It’s also worth noting that you may also know Xiamen as ‘Amoy’ – some people call it ‘Amoy’, the reason for which I never worked out. Arrival in the city of Xiamen was by bus from Shuyang. As with most of my travels in China, I was in awe of the views out the bus windows. Xiamen is a growing industrial metropolis, in fact it’s an odd city. It seems to appear richer than it is. Gasping skyscrapers and state of the art fashion shops all make an appearance in the city centre and top world brands flash their lights in a city which has Chinese backstreets and typical factories. A harbour front with a view looks over to the marvellous island of Gu Lang Yu (also worth a visit and I wrote about it on that link). 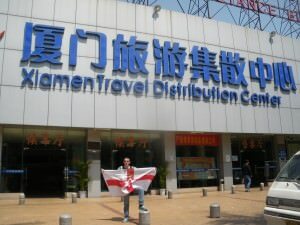 I arrived in Xiamen at the bus station, known in English as “Xiamen Travel Distribution Center”! The Portuguese, the British, the French and the Dutch for some reason all tried to unsuccessfully make Xiamen a main port for trade. The fact that it was unsuccessful probably explains why Hong Kong (once British) and Macao (once Portuguese) have infinitely more foreign culture influences than the neglected Xiamen. In Xiamen, some colonial buildings aside, you basically know you are in China. Let’s get back to the word ‘neglected’, as perhaps that is harsh. Xiamen is enjoying somewhat of a boom at present, with lots of Chinese factories nearby and the new rail links making this a decent port for trade. New offices and stylish apartments are being built in skyscrapers. Indeed I was surprised to hear that this city houses over 600,000 people. 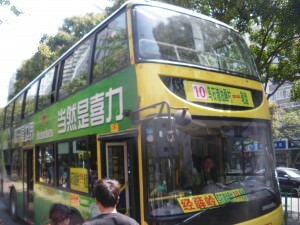 Xiamen’s bus network takes something to get used to!! One other thing of note is that Xiamen itself is an island called Xiamen, and the city called Xiamen is on the island of Xiamen. The prettiest part of Xiamen is the seafront, which is also great for eating out as you relax by the waterside. The most difficult part is negotiating the bus network. I have an advantage over other foreign visitors to Xiamen in that my girlfriend speaks, reads and writes Chinese! If it wasn’t for her, I’d have been lost. 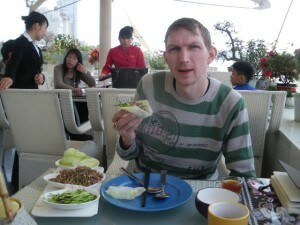 Enjoying a spicy beef meal by the harbour at Xiamen – decent place to eat! We didn’t stay overnight in Xiamen, as out flight was around midnight, but a day there is worth doing and there is a hostel there, with a website here: Xiamen International Youth Hostel . In terms of sightseeing in the city, basically there isn’t too much – the harbour front is great for a walk and the Nanputuo Temple is recommended. A university, a museum of Chinese overseas communities and a fortress are other possible sights but don’t forget to get the ferry across to Gu Lang Yu while you’re there! Xiamen Airport – we flew out to Hong Kong. Xiamen was the final stop on our short tour of the Fujian Province and a decent place to end it. We flew out of Xiamen Airport direct to Hong Kong. 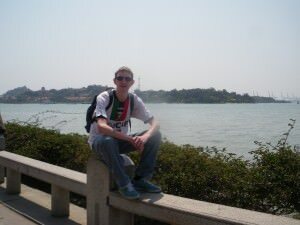 There will be one more story to follow at some point on Xiamen and that is on my odd quest to find an Irish Pub there!! 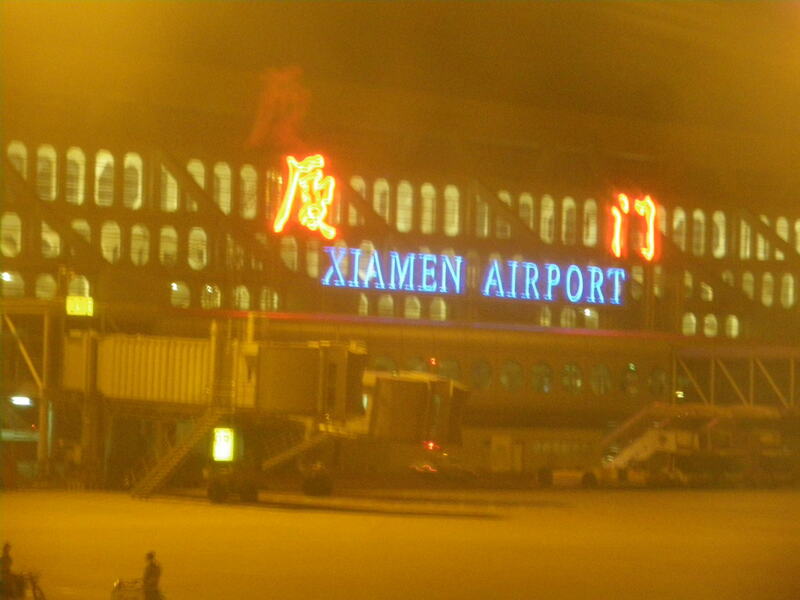 Thanks to Xiamen for being my first ‘X’ city. For all my China posts try here – Don’t Stop Living – China. One of the decent recent ones was on Tiger Leaping Gorge. I LOVE travelling in China. 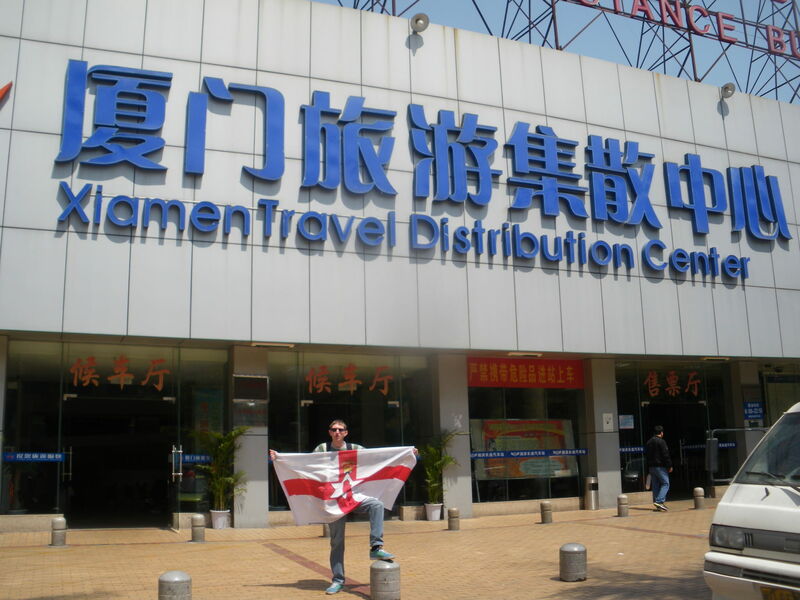 Don’t Stop Living – a lifestyle of travel is written by Jonny Blair – the travelling Northern Irishman! This entry was posted in Asia, China, Fujian, Xiamen and tagged China, Fujian, Fujian Province, Fujian Tulou, HONG KONG, Lang Yu, Nanputuo Temple, Xiamen. Bookmark the permalink. I must say your posts always give me a good laugh! I bet you could do an A-Z tour of China finding a city for every letter of the alphabet.